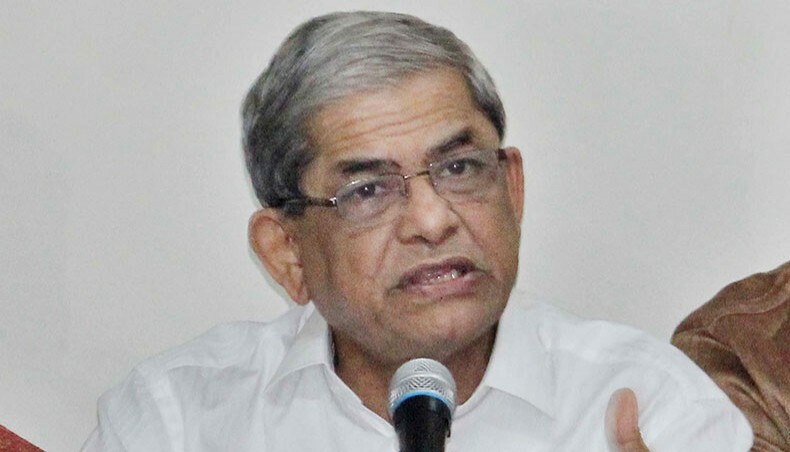 BNP secretary general Mirza Fakhrul Islam Alamgir on Monday alleged that the ruling party men attacked Amar Desh acting editor Mahmudur Rahman in Kushtia to kill him. Speaking at a human chain programme, he also alleged that Awami League has been continuously attacking journalists and those think independently over the last few years to restore one-party rule in a different style. “The attack was made in a planned way to kill Mahmudur Rahman,” he said. A faction of Bangladesh Federal Union of Journalists (BFUJ) and Dhaka Union of Journalists (DUJ) formed the human chain programme in front of the Jatiya Press Club protesting the attack on Mahmudur. Being informed that Mahmudur was confined to Kushtia court, Fakhrul said he phoned Home Minister Asaduzzaman Khan who assured him of taking necessary steps to ensure the safe return of the Amar Desh acting editor. “The way Mahmudur Rahman came under attack in presence of police is very unfortunate and unprecedented,” he observed. Fakhrul alleged that the Superintendent of Police (SP) in Kushtia is a greater ‘terrible terrorist than Awami League’. The BNP secretary general strongly condemned and protested the attack and demanded the government immediately arrest those involved in it and put them on trial. He alleged that the government in a planned way is attacking journalists and independent thinkers and trying to kill them. Speaking the at the programme, BFUJ president Ruhul Amin Gazi announced countrywide demonstrations and a sit-in programme in front of the Jatiya Press Club on Wednesday protesting the attack on Mahmudur. Besides, Sammilita Peshajibi Parishad will stage a demonstration in the city on Tuesday demanding the exemplary punishment of those attacked the Amar Desh acting editor.